For many gardeners, the first sign of spring arrives in the form of seed catalogs in the middle of winter. Glossy color pages provide the promise of flowers, fruits, and vegetables in the coming season. Seed catalogs can open up a wide array of possibilities not to be found in local garden centers. Savvy gardeners can choose from multiple colors of flowers or vegetables, find disease resistant plants or varieties especially well-suited to their growing conditions. 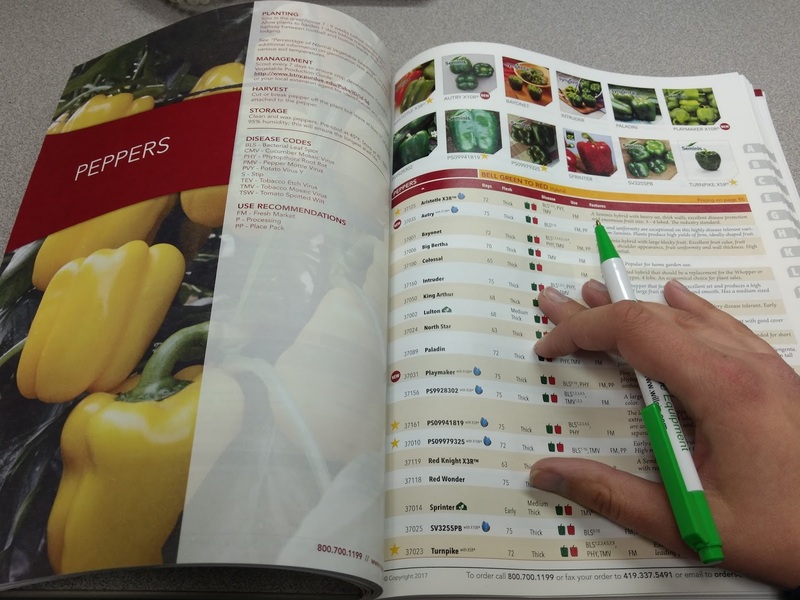 To make the most of what seed catalogs offer, it is important to understand the terms, abbreviations, and numbers that can be found in the description of each variety. Days to Maturity: Many catalogs list a number next to the variety's name. This is the Days to Maturity (DTM). It is the approximate number of days the variety needs from seed germination to harvest. Days to Maturity depends on variety. For example, the Racer Plus pumpkin in the Johnny’s catalog matures in about 85 days, while the Cargo PMR variety takes about 100 days (see photos below). In Minnesota, we garden in a relatively short growing season. When planting a crop with a long maturation time, like pumpkins or winter squash, you may prefer a variety with a shorter DTM. The DTM is approximate, and the exact number of days it takes a crop to mature is also affected by things like weather and soil quality. F1: This means the variety is a hybrid. Hybrids are bred from crossing two other varieties together in order to get certain desirable traits of both parent varieties. Examples of desirable traits include flavor, color, and disease resistance. We do not recommend saving seeds from hybrids in your garden, because they are usually sterile or will not produce a crop true to the parent plant. Open Pollinated (OP): If a variety does not say “F1,” it may instead say Open Pollinated or “OP.” This variety is not a hybrid. It can reproduce by itself and its traits remain consistent from one generation of seeds to the next. The Yankee red bell pepper is open pollinated, while the Red Knight red bell pepper is a hybrid (photos below). If you would like to save seeds from your crop, we recommend selecting open pollinated varieties. Organically grown: Seeds and plants that were grown organically will often be labeled with “OG” or similar. They were grown meeting the USDA National Organic Standards Board rules. Some catalogs sell both OG and non-organic options for the same variety. For example, the Johnny’s catalog sells OG and non-organic Katrina cucumber seeds. Determinate and indeterminate: Some vegetables have varieties of two different growth habits: determinate and indeterminate, and gardeners can choose based on their needs. Tomatoes are a great example of this. Determinate varieties grow to a certain size and then produce all their flowers at once, so the whole crop ripens around the same time. Indeterminate varieties continue to flower and ripen throughout much of the season. These words may appear either in the variety description or with a symbol. Disease resistant variety: A plant that can defend itself against a plant pathogen. Disease resistance is specific to one disease but plant breeders sometimes cross plants so that multiple forms of resistance occur in one variety. Look for letter codes listed after the variety name. You may see (F, V, TMV) after the name of a tomato variety. Each letter indicates a disease that this variety is resistant to. Seed companies do not all use the same letters to represent different diseases so check the catalog for a key to find out what each letter stands for. If no letters are present after the variety’s name, that variety is not known to be resistant to common diseases. It is important to know what diseases are present in your garden or in Minnesota when choosing resistant varieties. Some diseases are common only on farms or in other regions of the USA and resistance to these diseases is not an important factor in a Minnesota home garden. The online diagnostic tool, What’s wrong with my plant? can help gardeners identify disease problems they have encountered in previous seasons. High resistance: Very minor or no symptoms of disease will be observed during the growing season. Partial, low, or moderate resistance or disease tolerant: Symptoms of disease may appear but the plant will be able to reduce the damage done by the pathogen and will often produce a good crop. Treated seed: seed that has been coated with a fungicide or insecticide to protect the seedling from insect pests or diseases. Fungicide seed treatments only protect the seedling from damping off and do not last through the growing season. Treated seed is not necessary for transplants started indoors because gardeners can easily prevent damping off by using clean materials and keeping the potting mix at the right temperature and moisture for optimum seedling growth. Pelleted seed is seed coated with a hard covering often made of clay or other material. Pelleting is often done to small seeds like lettuce to make them easier to handle. This type of seed coat does not contain pesticides.